Paul Saber has been a restaurant owner since 1980. He was an Owner/Operator of McDonald’s restaurants from 1985-2001, owning 14 McDonald’s in New Mexico, and was Senior Vice President, USA Corporate Division of McDonald’s from 2001- 2003. In 2003 Paul became President & CEO of Manna Development Group, LLC and currently holds the Area Development Agreement for Panera Bread and Bakery Cafés in San Diego, North and South Los Angeles, and Orange County, CA and for Panera Cafés in Michigan, Oregon, Northern Indiana, Southwest Washington, Colorado, and Wyoming. Paul and the entire Manna organization are committed to excellence in operating great restaurants by delivering quality food and outstanding guest service. Paul serves on the Board of Directors of several Christian ministries, and served as Chief Operating Officer (COO) of the Billy Graham Evangelistic Association from 2007-2009. Paul and his wife Dianne reside in Rancho Santa Fe, CA and have an adult son, Graham, and a daughter and son-in-law, Hannah and Austin Rovazzini. Patrick started Manna Development Group with Paul Saber in 2003 assuming the role of Operating Partner. He loves Panera, especially the Cinnamon Crunch Bagel - and enjoys wowing our guests with service and great operations! Prior to Panera, Patrick worked for Ford Motor Company for 10 years. He earned his MBA from University of New Mexico. Patrick has been married to his wife Amber for 14 years, has 4 children and a crazy dog. "My favorite thing about Panera Bread, is talking to our guests, making sure they enjoyed their visit. I love that you can give them a free cookie and make their day, where else can you make someone’s day with a couple of dollars? I love working for Manna where I can live out my faith on a daily basis in the business world. It’s rare that you get that opportunity to work for a Christian Company that promotes their faith. Panera Bread gives us the opportunity to bless our guests, community, and associates, what a blessing!" In Patrick’s free time, he enjoys spending time with his family, and when he gets total free time - a good run or a long bike ride are the top of the list of fun things to do. Born and raised in San Diego, CA, Josh has been an integral part of Manna and Panera Bread for over 13 years. He was the General Manager of Manna's second bakery cafe in California before being promoted to District Manager, Director of Operations and his current position. Josh has always worked in the restaurant industry and prior to joining Panera he was the General Manager at the Chart House Restaurant in La Jolla, CA and the General Manager at Fins - A Mexican Eatery. Josh attended Baylor University in Texas before marrying his high school sweetheart. He and his wife Mary now have three girls and a boy. They love participating in sports, visiting Disneyland and Sea World as well as playing at the beach. Being a big sports fan Josh enjoys following the Los Angeles Lakers and San Diego Chargers. Josh was presented the Manna Pinnacle Award by Paul Saber in 2010 and was also a Panera Mother Bread Award winner in 2005. Jacob joined Manna Development Group July 2003, relocating from New Mexico to open the Escondido Bakery-Cafe. Jacob worked for Paul Saber prior to Panera Bread with McDonald’s restaurants in Albuquerque. Jake has served in many roles from training to operations. Jacob’s philanthropic work is a large part of who he is, having most recently been recognized by the Center for Assault Treatment Services of Los Angeles (CATS) as an Outstanding Community Partner. Jacob also received Special Congressional Recognition April 2013 for charity work done in the Los Angeles area. He is also very proud of receiving the Mother Bread award in 2005. Dan joined the Manna family in 2006 as an Assistant Manager of the La Mesa Bakery-Café after moving to San Diego from Philadelphia. The following year he took over the Mira Mesa Bakery-Café as a Training General Manager before transitioning to a District Manager for San Diego. Dan was promoted to the Director of Operations for Manna NW in the Spring of 2016. Dan enjoys many aspects of his job but the most rewarding part by far is watching his team grow to their fullest potential in their respective roles. Dan was formally trained as a Chef at The Culinary Institute of America in Hyde Park, New York. Dan and his wife reside in Oregon and just welcomed their first child, a precious little girl, in September of 2015. Dave has been in the food industry since 1983. In 2000, Dave joined the Panera family where he became a General Manager for one year before being promoted to a District Manager. In 2008, Dave became the Director of Operations for the Colorado market and he won the Mother Bread Award in 2012. Dave is very passionate about Panera and loves to engage with his teams as well as guests everyday! Dave is a big Ohio State Football and Denver Broncos fan. When not working, you can find him at the gym or on his motorcycle in the mountains. Born and raised in West Michigan, Paul began his career managing restaurants, including Ruby Tuesdays, as well as operating an independent book store in Downtown Grand Rapids. After graduating high school, Paul moved to Southern California for a short while and attended Los Angeles Community College. Starting as an Assistant Manager with Panera Bread in 2006, Paul eventually became a Training General Manager of several different Training Certified bakery cafes before taking on a District Manager role in 2012. 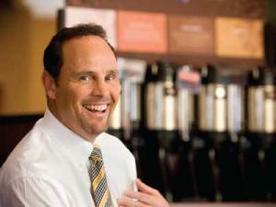 Paul was the recipient of the Panera Mother Bread Award in 2012. In 2018, Paul was promoted to Director of Operations for the Bread of Life market. Paul and his wife have 2 boys and are very involved in their activities including coaching and volunteering at their schools. He spends his free time hanging out with his family, working on his house, playing guitar, and playing or watching sports. Meghan started with Manna as an associate in July of 2003. She has managed Cafes, Catering and Marketing but spent most of her time in the Training Department. She oversees the development of our team at all levels as well as audits and café openings. Meghan's favorite part of her job is seeing people grow and thrive into new roles and her favorite Panera menu item is the Pecan Braid. Meghan was presented with a Panera Mother Bread Award in 2007. She has her Bachelor's Degree in Hospitality from New Mexico State University. Meghan resides in Downtown San Diego, with her Husband and dog Fergie. Jennifer joined the Manna family in March 2004. Her primary duties include Financial, Tax, and Compliance Reporting, Audits, and Software Systems. One of her key initiatives is reducing café administrative friction through improved processes and technology. Jennifer was a Mother Bread recipient in March 2009 and recipient of The Mark Saber Pinnacle Award in 2012. Prior to joining Manna, Jennifer was the Manager of Accounting Services at Barsa CPAs. Jennifer enjoys hiking, book club and traveling and is an avid hot sauce fanatic. David began his Panera career almost back to beginning of Manna Development in 2003 working in several roles over the years before assuming his current position. Prior to Manna, David worked for a New Mexican restaurant concept before moving on to work for Brinker International's Macaroni Grill for 13 years. David Attended the University of New Mexico/ David grew up working on the family cattle ranch in Puerta de Luna, New Mexico and attended the University of New Mexico. David has been successful in creating an environment of the highest baking standards while developing people to achieve their highest potential all while demonstrating the love of Christ through his leadership. David and his wife reside in San Diego and recently celebrated their 25th Anniversary. Richard has been working with Manna since 2003. He has built over 40 of the Manna bakery cafes as well as the Manna offices. He has over 27 years of experience and expertise in construction. Richard is from New Zealand and has lived in California since 1985. He moved to Carlsbad in 1994, then Built his own house in 1997 where he and his family still reside. Richard has been married to his wife Barbara for 25 years, They have a son Chris and a daughter Ashley. Richard is an avid golfer still in search of that ever-elusive hole-in-one. Melanie joined the Manna team in March of 2013 as the HR Director. She has assisted in creating HR policies and procedures to ensure we follow legal requirements as well as to promote employee wellness and collaboration. Prior to working with Manna, Melanie held both HR and Managerial roles with Target and Outback Steakhouse. Melanie earned her Business Management degree from San Diego State University. She enjoys spending time outside in Sunny San Diego with her Husband and three Daughters. When not in the office, you can find Melanie and her family at the beach, camping or hiking. Nick loves spending time with his wife Ana and son Lincoln. Born in Illinois, Nick was raised one of seven children in Southern California. Nick is a sports enthusiast and enjoys playing and watching sports. Jennifer has been with Panera Bread since 2008, and grown with the Catering Department to Senior Regional Catering Sales Manager. Her main objectives include overseeing sales efforts and growth initiatives to lead catering teams to success. Jennifer is originally from Florida, earning a Bachelor's of Arts degree in Communications & Marketing from University of Central Florida. Outdoor & beach activities occupy much of her free time.